Go to: WordPress Admin > Plugins > Add New and Upload Plugin using the file you downloaded with Choose File. More information at: Installing and Managing Plugins. Go to WooCommerce > Settings > Tax and scroll down the page. VAT Number Field Label – Shown to users at checkout. Default is VAT Number. VAT Number Field Description – Shown below Label at checkout. Default is blank. Remove VAT for Businesses in Your Base Country – If enabled, businesses with a valid number in your base country will be VAT exempt. Failed Validation Handling – Tell the plugin what to do if a VAT number fails validation. Enable B2B Transactions – This will force users to check out with a VAT Number, useful for sites that transact purely from B2B. EU VAT laws for digital goods changed on January 1, 2015, affecting B2C transactions only. VAT on digital goods must be calculated based on customer location, and store owners need to collect evidence of this via IP address and Billing Address. Tax Classes for Digital Goods – Select which of your Tax Classes is specifically for digital goods. This ensures the user is charged tax based on their Billing Address and not the base or shipping address that physical good taxes are often calculated with. Collect and Validate Evidence – Tick the box to validate the user’s IP address against their billing country. 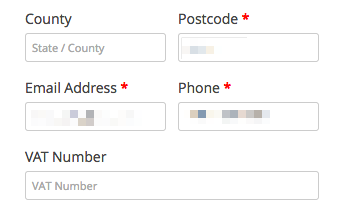 If they mismatch, the user is required to confirm their address is correct (self-declaration). Data is stored in the order. For EU VAT on digital goods, you need to input VAT rates into WooCommerce. We have a guide for this at: Setting up EU VAT Rates for Digital Products. The checkout process varies depending on the type of customer. *Customers located outside the EU will see no fields because they are out of scope for EU VAT. 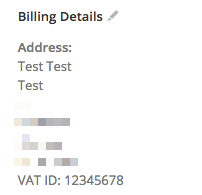 The system then validates the number via our EU VAT Number Validation API, which takes data from VIES. If you configured the plugin to handle EU VAT Digital Goods for rules implemented in January 2015, the checkout process differs slightly if the cart contains a digital (non-shippable, virtual) product. First, the IP address is validated against the billing country behind the scenes. If this matches, it is stored as evidence of the user’s location. If it doesn’t match, a checkbox to confirm location appears. Customers can view and modify their VAT number on their My Accounts page. The VAT number country must match the country in the billing address. Collected data displays in several locations in Admin. Note for developers: VAT Numbers are stored in a meta field named _vat_number (and VAT Number for backwards compatibility). EU VAT Number adds two reports to the reporting section at WooCommerce > Reports that may be useful. 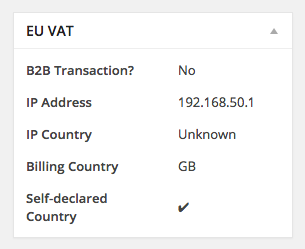 Reports > Taxes > EC Sales List – Lists countries and order amounts from EU-based B2B customers grouped by VAT number. Reports > Taxes > EU VAT by State – Shows taxes collected and order amounts grouped by Country. Each report has pre-set ranges to view data by quarter.